Welcome to Classic Ridge Retreat Amazing living room with large stone wood burning fireplace. Plenty of seating and a flat screen TV. Large gourmet kitchen with gas stove and stainless appliances. Keurig and 12-cup coffee maker, fully stocked to make wonderful meals. Large gas stove and beautiful butcher block countertops. This island is massive. Another view of this very nice kitchen. Large dining table that can seat up to 8 people. There are 4 more seats at the island bar. Another view of table and kitchen TV room off the foyer. This room can also make a 4th bedroom with this amazing fold out couch. Very comfortable View of TV in the TV room on the first floor. Great place to read, watch TV or this room can be used as a 4th bedroom. Large full bathroom downstairs with tile shower and tub. Washer and Dryer room is downstairs for guest use. Detergent included. The magical queen canopy bedroom located upstairs and across from the bathroom. The room has a calming yellow paint with crisp linens and pillows Cozy into this amazingly comfortable queen bed with all the pillows and soft linens High end wood bunk beds with beach themed pillow and linens. Great place for the kids to have their space Another view of the bunk room. There is kids toys and books in this room too. Luxurious king master suite with large master walk in closet, views of the mountains, trees and golf driving range. The king bedroom has an attached master bath, desk and large flat screen TV with DVD player Double marble top vanity in the master bath. Jetted master bath tub has a wonderful view of mountains and trees. View out the window of master jetted tub The upstairs window seat is perfect for cuddling up with a book or just relaxing in the coastal sunshine. View of the back of the house. Great fenced in yard. Beautiful views from the backyard. Relax next to the firepit with friends, family and a glass of wine. Enjoy s`mores or a glass of wine around this huge fire pit. Peaceful and beautiful fenced in backyard with fire pit. Outdoor patio with table and chairs. Gas BBQ is close by. Large dog run along back and side of the house. Ping Pong Table in the garage Ping Pong Table, Firewood and an extra fridge/freezer in the garage. Manzanita Beach is just a 8-10 minute walk to the beach. Manzanita Links Golf Course is close to the house. You can walk right down to the driving range which is just behind the house. Classic Ridge Retreat is a beautiful 2,400 sq ft home with high end finishes, large gourmet kitchen, stone, wood burning fireplace, WiFi, a peak of the ocean and much more! 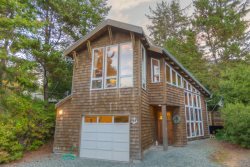 With three bedrooms and three, full baths you are sure to find all you need in this Manzanita vacation rental. Enjoy the amazing location of this home, just steps to the golf course and driving range and less than 15 minutes to the beach! Through the front door, your invited in by large windows, beautiful wood floors and a massive river rock fireplace. The large living room opens to the dining and kitchen area for easy entertaining. The living room has plenty of seating with high quality, comfortable furniture arranged in front of the stone fireplace. The large, solid wood dining table is perfect for family dinners. There is also seating at the bar in the open gourmet-style kitchen. With all stainless steel appliances and a gas cook stove, you will feel right at home. There is a TV room with large flat screen TV, a recliner rocker and sleeper sofa for additional sleeping accommodation. All bedrooms in this home are upstairs. The queen bedroom has an amazing, four-poster bed with beautiful linens and pillows. The room is equipped with everything you need to cozy in for the night. Across from this bedroom you will find a full bath with tub and shower. The middle bedroom has two sets of twin size bunk beds. A great room for kids! There is a ping pong table in the garage for the entire family to enjoy! The master bedroom includes a king bed, flat screen TV, walk in closet and full bathroom suite. The bathroom has a large jetted tub, custom tile walk-in shower and double vanity sinks. Classic Ridge has a 10 person occupancy. This could be heaven! Fully fenced large yard for dogs and little ones. Full dog run with lock in the back yard for kennel trained dogs only that will not bark. Lovely house with excellent amenities in a beautiful setting. Amazing property! Would stay there again! Would recommend to others! Great amenities! Loved the home! Thank you for allowing us to relax in such a beautiful home and surroundings! We will be back!! Kelly was very nice and helpful. Everything was wonderful, except that the driveway is tricky to get in and out of, due to a gravelly drop off between it and the street, which scraped on the underside of the car each time we went in or out. It looks like there may be road work going on all along the street and they just haven't fixed the shoulders yet, so hopefully it will be a temporary condition.